The deadly virus has already claimed almost 500 lives across West Africa this year, and deforestation could cause that number to keep climbing. In a relentless sweep across Guinea, Liberia, and Sierra Leone, the largest outbreak of Ebola—a virus that causes to dramatic internal bleeding and often a hasty death—has now claimed 467 lives from 759 infections since February of this year, according to the World Health Organization (WHO). With victims identified across more than 60 different locations, there’s now a very real risk the outbreak will spread to even more countries, says Médecins Sans Frontières (MSF), which calls the epidemic out of control. 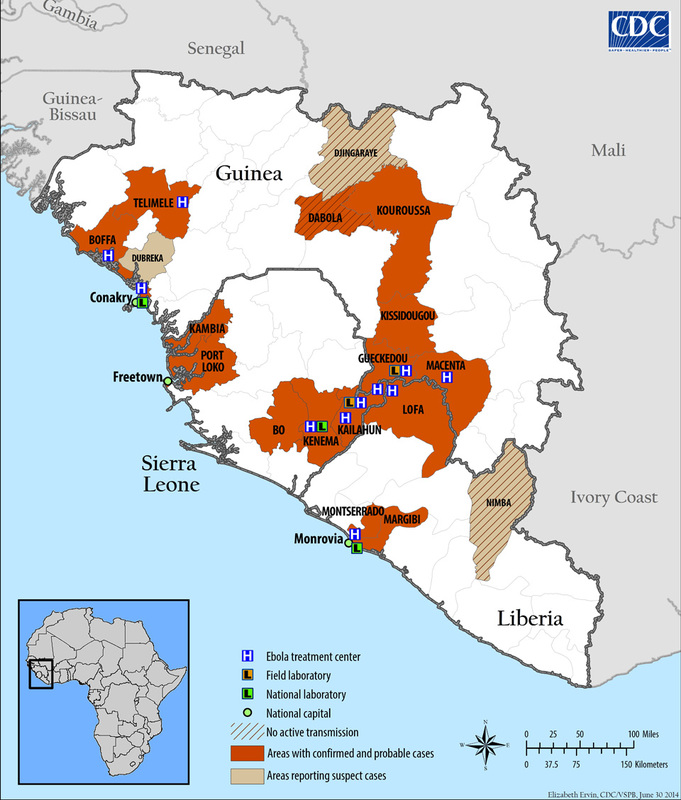 Guinea, Liberia, and Sierra Leone in 2014.
WHO is now focusing on preparing for the disease’s inevitable spread to neighboring countries, not a small task in poor countries with poor health care systems. “We want other countries in West Africa to be ready—bordering countries, Ivory Coast, Mali, Senegal, Guinea Bissau—to prepare themselves in case people affected with the disease may be also traveling,” WHO’s Dr. Pierre Formenty told a recent briefing in Geneva. In Côte D’Ivoire, Guinea and Liberia’s neighbor to the east, federal health officials have joined customs agents at the notoriously porous border in the hope of stopping the disease’s spread; meanwhile, MSF has set up isolation centers nearby to contain infected persons if they do appear, says Anne Cugier, MSF’s mission chief in that country. ”We are all concerned about Ebola potentially spreading to Ivory Coast,” she said. But Ebola is an elusive and very effective assassin, leaving scientists floundering to fit the pieces of the virology puzzle together. The science behind how and why Ebola spreads has yet to be fully nailed down—there’s very little surveillance of the early stages of the disease deep in the African forests, where it may have been circulating in animals for a long time before “first contact” with humans. In this particular outbreak, it appears that the first diagnosed case was a doctor in the rural town of Gueckedou, whose infection then spread to health workers and family attending his funeral. Researchers believe that butchering and eating infected “bushmeat”—a bat or gorilla, for example—usually serves as the first exposure to diseased animal blood. In Côte D’Ivoire, the risk of Ebola transmission from bushmeat, which is a popular menu item at rural maquis (roadside outdoor grills) is considered high enough by federal health officials that it was recently banned altogether. But according to my colleague Tim McDonnell, who is in the country right now, there is no way to enforce the ban, and bushmeat is still being sold and eaten. What is becoming clearer, however, is that human activity is playing a major role in the initial outbreaks of these zoonotic diseases—those that jump between animal and human—like Ebola. Humans are venturing farther into forests, putting more and more pressure on local ecosystems through small-scale gold and diamond mining, deforestation, and conflict. In remote West Africa, people are increasingly coming into contact with animals—and that, combined with traditional hunting practices, is driving up the risk of a “spill-over” occurring, where Ebola can leap across species. Melissa Leach, the director of the University of Sussex’s Institute of Development Studies, lived for several years in the border forests of Guinea where this latest outbreak first began. She says the forest landscape there is complex and ever-changing—a “mosaic.” Villages here are surrounded by forest and agriculture, and that means bats—thought to carry Ebola—are everywhere. “I lived in a house in a village in Kissidougou district for two years which was full of bats in its roof,” she says. Human activity is driving bats to find new habitats among human populations. More than half of Liberia’s forests—home to 40 endangered species, including the western chimpanzee—have been sold off to industrial loggers during President Ellen Johnson Sirleaf’s post-war government, according to figures released by Global Witness. Logging, slash-and-burn agriculture, and chopping down trees due to an increased demand for firewood, are all driving deforestation in Sierra Leone, where total forest cover has now dropped to just 4 percent, according to the United Nations Environment Programme (UNEP), which says if deforestation continues at current levels, Sierra Leone’s forests could disappear altogether by 2018. “We see deforestation or incursion into forests, whether it’s through hunting or just alteration of landscape, causing people and wildlife to have more contact,” says Epstein. The 1994 outbreak of Ebola, which killed 31 people, occurred in gold-mining camps deep in the rainforest. Mining also appears to be a feature of this latest outbreak: Its epicenter is in the southeast of Guinea, close to iron ore reserves, according to Reuters. Mining “has become a big livelihood activity across the regions—Sierra Leone, Liberia, Guinea—as of the last couple of decades,” says Leach. And that means more mines in the forest, but also “immense movement, people going seasonally in and out of mines, coming in and out, young people coming from all over the country.” Guinea is the world’s top exporter of bauxite, the raw material used in aluminum production, according to Reuters. “That whole sense of movement is something that means that a disease, an outbreak, once established in a place, is very likely not to stay in that place; it tends to move quite quickly,” Leach says. Iron-ore mining boomed in Libera last year, for example, after a surge in public and private investment. According to Bloomberg, the nation gets most of its income from mining with several major international players in the market, alongside smaller gold and diamond mines. The international Monetary Fund said mining spurred a 20 percent growth in GDP in Sierra Leone in 2013, after a flood of investment from British companies in iron ore. Conflict is also driving humans into forested areas. Survivors of Sierra Leone’s civil war, which ended in the early 2000s, hid and slept in the forest, according to Human Rights Watch. The movements of refugees have had a lasting impact, says Leach. “There is still a lot of cross-border interaction of people through contacts that were established in the postwar period,” she says. A 2010 UNEP report on postwar Sierra Leone also says that in the postwar years, people in this region have become increasingly reliant on the forest animals for food, and wood from trees for fuel and building materials. West African countries are already feeling the effects of climate change, the International Food Policy Research Institute noted in a report published last year. There are now more “seasonal droughts, strong winds, thunderstorms, landslides, heat waves, floods, and changed rainfall patterns.” All that is changing the forests where Ebola first begins to take hold. Dry conditions can cause fires, which fragment forests, says Leach. That splitting up of forest increases the likelihood that bats will try to find other places to live, sometimes among human populations. Dr. William Karesh, another EcoAlliance epidemiologist, says it’s also possible that increasingly frequent extreme weather events also may also play a role in predicting Ebola, but he warns that much of the picture is still left to be filled in by scientists. Ebola in the United States? In 1989, Ebola was detected in monkeys imported from the Philippines at quarantine facilities in Virginia and Pennsylvania, but there were no human patients. The following year, the same thing happened again in Virginia and Texas. Four humans developed antibodies, but did not get sick. In 1996, again in Texas, monkeys from the Philippines were found to have Ebola, but there were no human infections then. In theory, the current outbreak could could make its way to American soil, most likely via a traveler exposed in West Africa arriving at a U.S. airport, but it’s unlikely that its damage would be widespread, says Epstein. That’s because of good public health systems that monitor and control diseases in the United States. But where any threat exists, “it speaks to the importance of containing and controlling the outbreak where it’s happening, in the countries of origin,” he says.